Last evening I conducted a Pinot Noir Masterclass at North Loop Wine and Spirits. A dozen people plus myself enjoyed a great evening of education and tasting going over the history, styles, nuance, food pairings, and future of Pinot Noir. I split the class into two parts. The first half was tasting a variety of Pinot Noirs from widely different locations around the globe including Chile (Apaltagua Reserve), New Zealand (Momo), Burgundy (Drouhin Cotes du Nuits Villages), and California (Kosta Browne Russian River 2006). The goal was to discuss world differences in terroir, and see if we could find common links (or contrasts) in styles. Very eye opening. The second half was focused on one winery, the wonderful Bethel Heights of Willamette Valley, Oregon, to examine winemaker and vintage influence and how it can impact Pinot Noir. We tasted the 2009 Willamette Valley, the 2009 Estate (the one with the black label), and the 2007 Casteel Reserve. It was a perfect way to examine the topic of vintage and winemaker influence, for each of these wines were made in a non-interventionist style but with different barrel treatments and aging regiments. In the end, there were three wines that stood out for completely different reasons. The Drouhin Cotes du Nuits Villages 2009 was stunning. For such a young Burgundy, it’s showing all the juicyness and punch that the vintage is delivering to these wines. The style was right down the tracks, with focused raspberry and moderate spices in the nose, and excellent acidity in the finish. It showed, perfectly, what a top quality young Burgundy is all about. 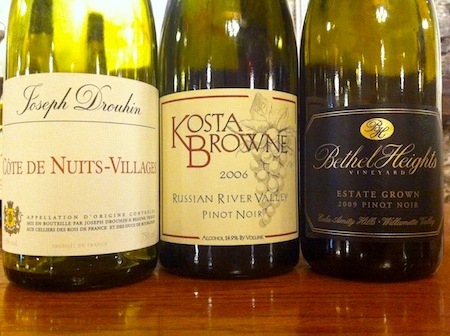 The second standout was the Kosta Browne Russian River 2006. Kosta Browne, if you’re not familiar with it, is a ‘cult Pinot’ and as I told the class I call it a ‘Sasquatch wine.’ (“There is a grainy 8mm film of a bottle of Kosta Browne running through the woods but nobody has proven that one exists! We have found evidence of bottles on the ground and have taken plaster casts of the impressions for further study.”) This wine, in this setting, was fascinating. I talk quite a bit about the context of a wine and how the aromas and flavors will shape-shift depending of a huge variety of factors, one of the them being other wines you are trying at the same time. All the other Pinot Noirs in the class were acid-driven with strong Pinot Noir typicity. 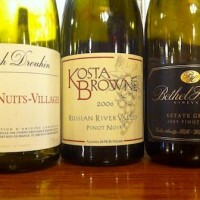 The Kosta Browne was delicious but had less to do with Pinot Noir than the other wines. Higher alcohol, a rich style, and lower acidity all added up to a style of wine far more suited for drinking on a winter night next to a fireplace than having with a meal. It was a plump wine, but with amazing texture in the finish. The third great wine of the night was the Bethel Heights Estate Pinot Noir 2009. It has been a while since I’ve had a Pinot Noir that is singing pitch-perfect as much as this wine. The group all agreed, and it was the wine of the night. It’s young, but I like younger wines in general myself (I have a paranoia of a wine dying while I own it) and this wine with a charcoal grilled rack of lamb is about as perfect of a combination as I could imagine. 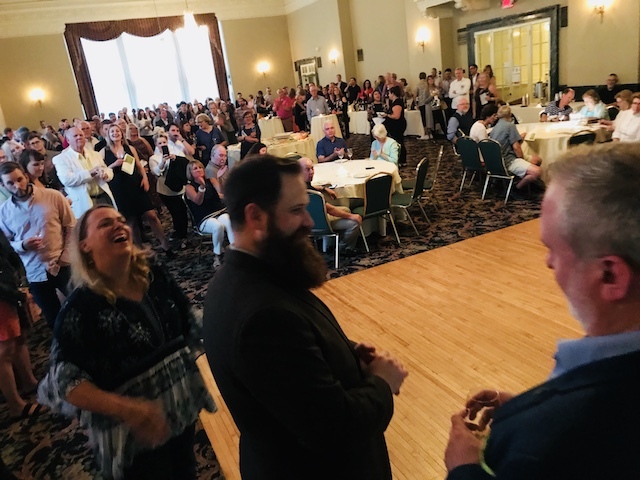 It was a great event, and thanks to all who came. Next up is the Blind Syrah Challenge on November 7th. We’ll pop Syrah from Australia, France, and California ranging in price from $15 to over $50 and serve it all blind to determine what we really are looking for in this great grape. See you then! Disclosure: During the day I work for The Wine Company, the local distributor for two of the labels in this article (Drouhin and Bethel Heights) but I do not sell wine to North Loop and have no financial incentive in discussing the products. And you picked the right kind of Kosta browne. I’ve found the appellation wines to be better than the single vineyards. Dropped off the mailing list when the prices skyrocketed almost overnight.